YipTel Audio Conference Calling provides small to large scale audio conferencing services that are easily managed visually from the web and via mobile devices. This delivers powerful yet simple-to-use conferencing services with the ability to mute participants, adjust volumes, disconnect attendees, record the conferences, and much more. This visual view of the conference provides you the ability to see who has joined the call and provides you with individual control of each attendee. You can choose local and 800 numbers for your clients to call in to the bridge. Simple and reliable audio conferencing. Users can access the audio conferencing tool one of two ways. To access the web interface, a user simply goes to www.yiptel.com/login, chooses the Audio Conferencing option, and logs in with their provisioned credentials. It will ask you for your Moderator and Participant Codes to log in which will have been given before hand. Upon logging in, the Moderator will have the ability to invite, manage, and review current and past calls. When you first come into the interface, the Current Call option is selected. This option allows you to manage a conference, as described in the following section. For those who have downloaded our desktop application, the client offers an easy-to-use dashboard that pops up from the application. You will have many of the same features and functions that are found in the web portal. 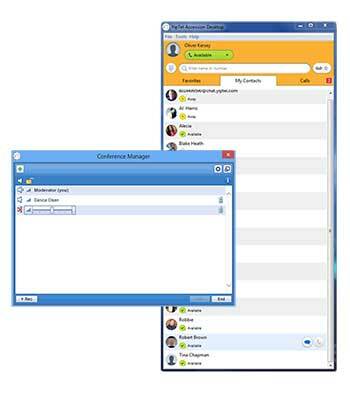 The YipTel Audio Conferencing solution provides a feature-rich user interface for participants and moderators to utilize. The panel for each participant (including the moderator) shows the following details. The participant’s calling telephone number. The participant’s name, if the Conferencing server can determine it. This is taken from a directory entry matching the calling number, if there is one, or from the caller name that the server received when this participant dialed in. You can change the displayed name as described in Changing and storing participants’ names below. A Mute button, allowing you to mute this participant’s phone so that no sound from it is played into the conference. A Drop button, allowing you to remove this participant from the conference. A gain control, allowing you to balance this participant’s sound level so that all participants can be heard clearly. Gray: the participant is in the call but is not currently speaking. Green: the participant is speaking, or other sounds are being played into the conference from the participant’s phone. Yellow: the moderator has muted this participant’s phone. Our conferencing solutions will drastically improve communications and productivity in the office. These services are all priced and managed separately from your standard DID extension. Feel free to get in contact with a YipTel sales representative today to discuss all of your audio and video conferencing needs. If you have any questions surrounding this service, contact our team on 800-886-5369.